Outgoing White House Press Secretary Sean Spicer gave his first interview since announcing his resignation Friday to Fox News Channel's Sean Hannity, saying President Trump didn't want him to resign and it was his own decision. "He didn't," Spicer said, when Hannity asked if Mr. Trump wanted him to leave, according to excerpts of the pre-taped interview. "He's been very gracious throughout this process. He wanted to bring some new folks in to help rev up the communications operation, and after reflection, my decision was to recommend to the president that I give Anthony [Scaramucci] and Sarah [Huckabee Sanders] a clean slate to start from." "So that they can talk about the president's agenda and help move it forward, and he, after some back and forth, understood that the offer that I was making was something that was in the best interest of the administration," Spicer added. "I thanked him for the opportunity and I'm looking forward to watching Anthony and Sarah do a tremendous job." Hannity also asked Spicer about his assessment of "the media," which Spicer said that many people would be "shocked and disappointed to see some of the bias that exists in some of the stories that don't get told, or the manner in which they are told." As for Melissa McCarthy's famous portrayal of Spicer on "Saturday Night Live," Spicer said "a couple of parts of it were funny" but "a lot of it was over the line." Spicer announced his resignation after Mr. Trump selected Anthony Scaramucci to be his new communications director, a decision that factored into Spicer's decision to leave, CBS News confirmed. Sarah Huckabee Sanders, who has served as the deputy press secretary, will be the new press secretary. Spicer said he has "no regrets" about taking the job and that he would always be grateful to Mr. Trump for giving him the "unbelievable honor" of serving. White House chief of staff Reince Priebus is also making an appearance on Hannity's show Friday night. "You look at people who were around the president and might not be working for him anymore, he's still very close to those people," Priebus said.. "They're still very important to the president. 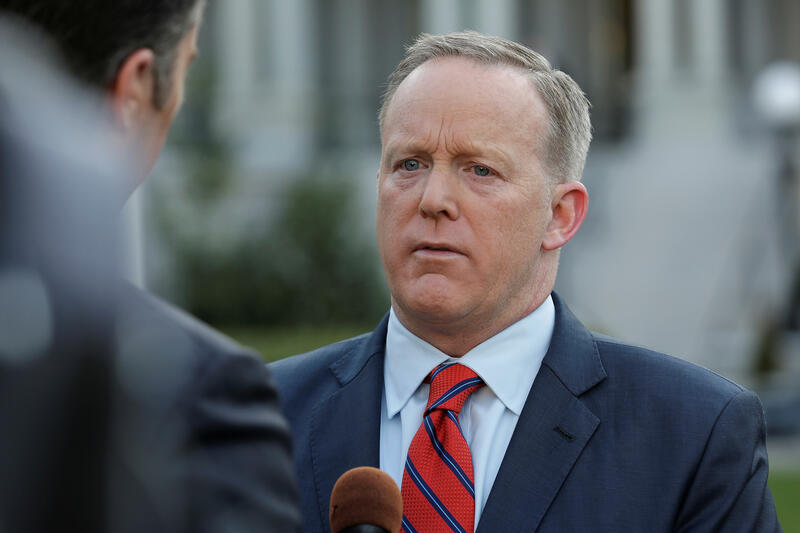 Sean leaving doesn't mean that Sean isn't going to be out there supporting President Trump and it doesn't mean that President Trump isn't going to be out there supporting Sean Spicer. I've seen how the world around the president works and it's very healthy and he cares about his people." CBS News previously reported Spicer had been seeking a more strategic communications role in the White House in recent weeks. But he had taken more of a background presence, with Sanders taking over most of the White House press briefings. Spicer had been serving as communications director since May 30, when former communications director Mike Dubke left that post. Mr. Trump tweeted about Spicer's departure, writing that "his future is bright!"